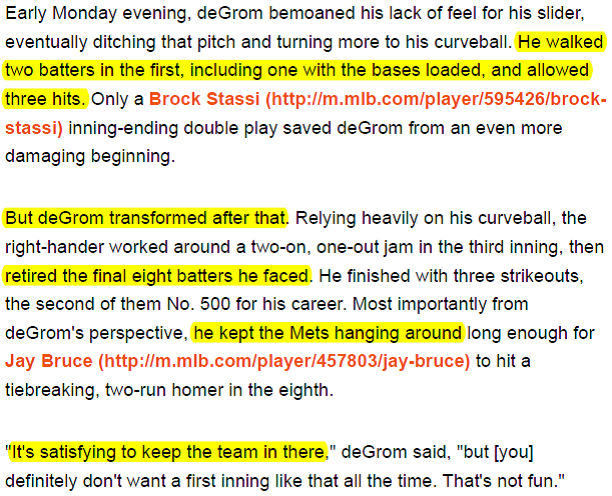 We now learn from Jacob DeGrom about perseverance. Will you let a bad inning run you out of the game? Or will you fight to grind out a solid start? than if you sail through 7 innings with your best stuff. Gary Cohen: "So Jacob DeGrom gave up 2 runs and 3 hits in the first inning and then no runs and 3 hits over the next 5 innings. It’s a story we have seen before with Jake but every time he does it, it just impresses you more and more with the ability to make the adjustments he needs to prevent his start from being a disaster." Ron Darling: "I know fans at home love when Jacob DeGrom is on top of his game with 10 or 12 strikeouts and the hair is flowing and it’s a great scene. But you’re almost judge by how good are your poor games? And his poor games are very good and it’s one of the reasons I really enjoy watching him pitch." Are you being trained as a pitcher to correct your mistakes? Do you know how to adjust to use what pitches are working well that night? "You can't sulk. You have to get outs."